Some people just aren’t who – or what – they are labeled. 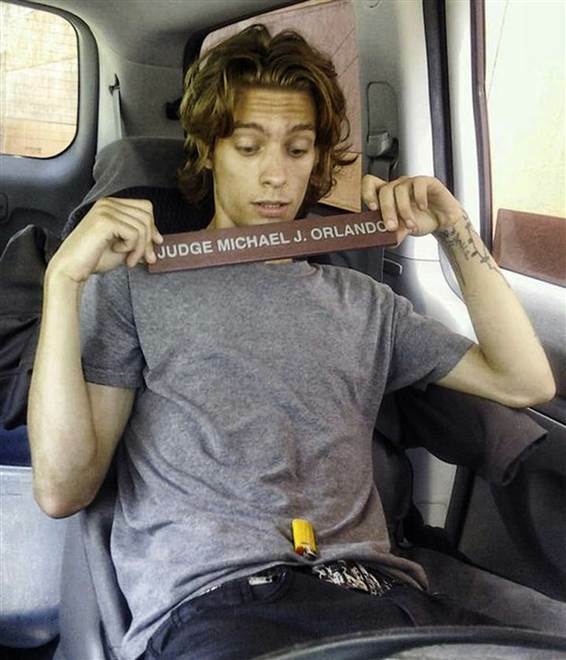 Take this young man, for instance: not a real judge (but he did end up in front of one soon enough!). Others are misrepresented on purpose but for completely lawful purposes, like models in ads on billboards, television and the internet. You do know that photographs of models – and movie stars too (poor Julia Roberts, getting her ad banned in England) – are airbrushed extensively before the advertisement ever gets published, right? Even the models themselves don’t look like the models you see in magazines. Julia Roberts in the banned ad. Look at that flawless skin! Here’s another way to photograph models for magazine and billboard advertisements: either show the models as they are, or tell everyone the photo’s a fake. I wonder what that would do to the fashion industry. Do any of us really want to see others as they truly are? Or perhaps more to the point, do I want others to see me as I truly am? I probably … no, I definitely do not. Not only is it a bit unnerving to think someone could learn things about me that I know are terrible, it’s not so hot for the person doing the observing either. Yet there is one person who knows me, and I’ve come to learn over the years that there’s no reason to regret it. Many of us are familiar with Psalm 139 and the assurance that God knows every fiber of our being. That passage is comforting; it’s all about babies and being formed in our mothers’ wombs. (I wrote on that a while back.) I recently read something about David, though, that really opened my eyes to the fact that God not only knows us well, he knows the darkest corners of our lives really well. King David was a murder, adulterer, conniver, schemer and liar. (2 Samuel 11-12.) He was also a man after God’s own heart. (Acts 13:22.) How could that be? Was it because God didn’t know the true David? No, not if 1 Chronicles 17 is any indication. And that’s what hit me like a blow to the head: For you know your servant, LORD. Yes he did and yes he does. He knew all about David and he knows all about me. He even knows me better than I know myself. Yet he chose me and he loves me. And because I know he knows all about me, I don’t have to worry that his love for me is temporary or that it might be taken away the moment he discovers my darkest secrets. No, God chose me in spite of my sinfulness, in spite of my darkness. He really loves me. 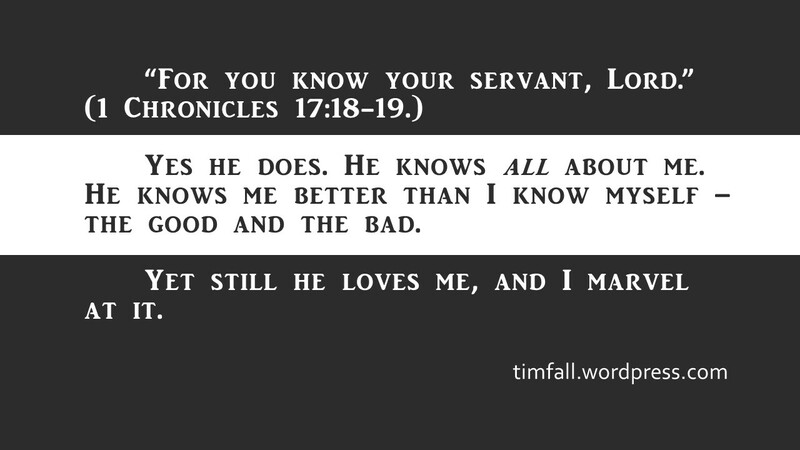 I am so glad God knows his servant. This entry was posted in Uncategorized and tagged David and Nathan, God's grace, God's love, Julia Roberts, Psalm 139, Servant of God. Bookmark the permalink. It’s kind of scary that God knows us so well. Yet as you say He knows and still loves and chooses us. It’s rather humbling. If only we could be so loving to our fellow man and they to us so that we didn’t always feel like we had to hide who we are from each other. Good insight, Jeremy. Jesus’ love can break down walls. We can break them down between each other too when we love as he does. I don’t recall ever reading those words of David before; thanks so much for calling them to our attention, Tim. God knows us so intimately, far better than we know ourselves, and still loves us, pursues us, and keeps on showering us with His grace. I know me almost as well as God does and there are times I don’t like myself very much. God loves me always. He gives grace when I would refuse it to myself. Wow.